New York City is one of the must-visit destinations in the world. There are so many interesting places here, which can make it quite overwhelming for those who only have a short four days to spend in NYC. 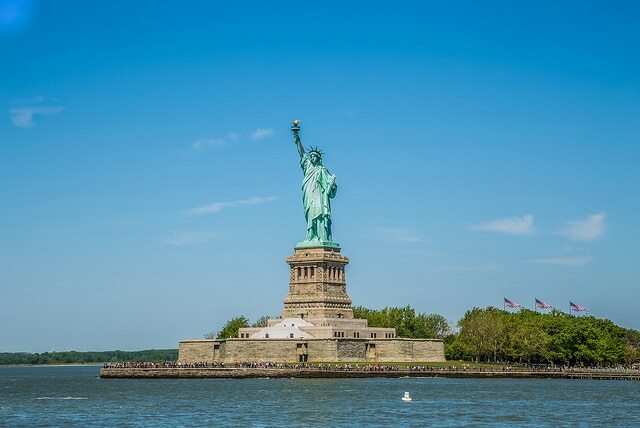 Before you get into the panic mode, check out this New York itinerary 4 days for Muslims and learn how to spend 4D3N in the lively city of Big Apple! 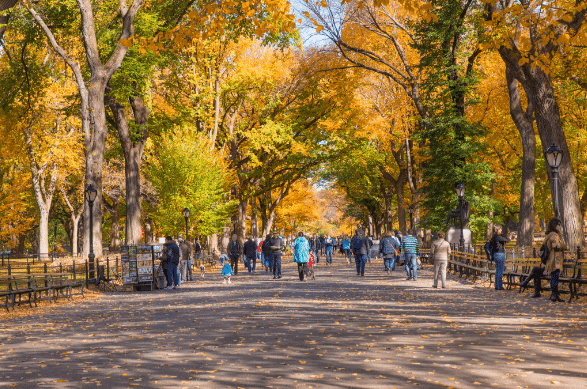 New York Itinerary 4 Days for Muslims – A Fun-Filled Travel Guide for You to Enjoy! No trip to NYC is complete without a visit to the Statue of Liberty. You can get there by taking the Staten Island Ferry. It will circle around the small island and give you a complete view of the green lady. Snap a couple of photos for memory sake. 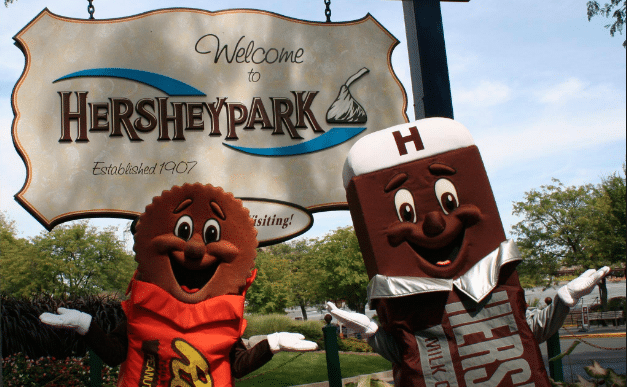 Mr. & Mrs. Halal Traveling Tip: Just like any other famous tourist attractions, it is best to go there early in the morning – to avoid the crowd and long queues. You can then stop over at the Ellis Island. There is Ellis Island Immigration Museum and here, you can learn a thing or two about the immigrant history of America. 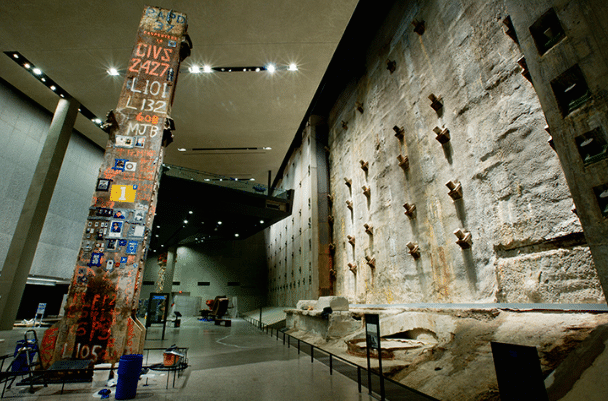 After that, head over to the Ground Zero Museum to learn more about World Trade Center and the tragedy related to it. These activities alone will take about half your day. In the evening, you can stroll at the Wall Street. This is the famous financial hub in the country. 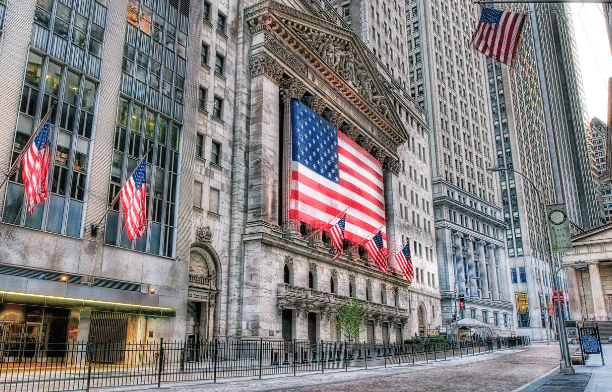 Here, you can take pictures at New York Stock Exchange (NYSE). There is also Federal Hall Museum nearby for you to visit. 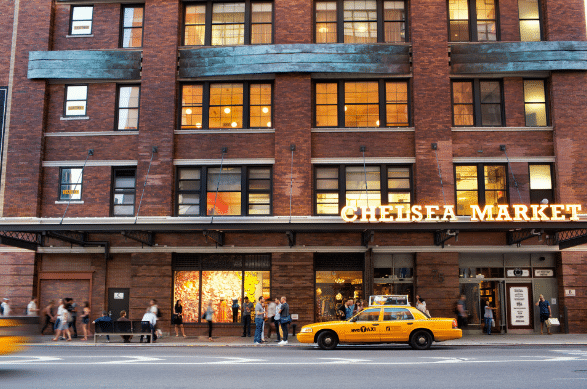 To get closer to the locals, you can go to Chelsea Market. 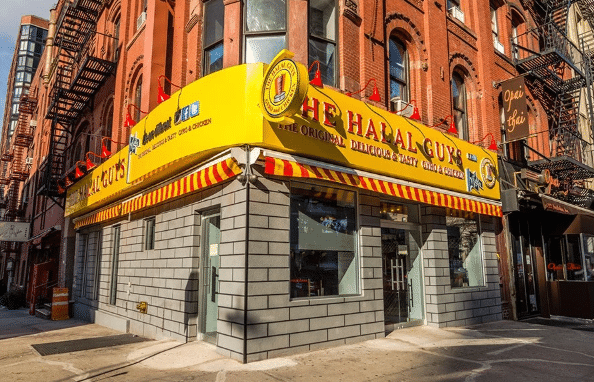 For more halal foods near Chelsea, check out the list here. If you are up for some yellow cab experience, grab one and head over to Brooklyn Bridge. It is one of the landmarks in the city. 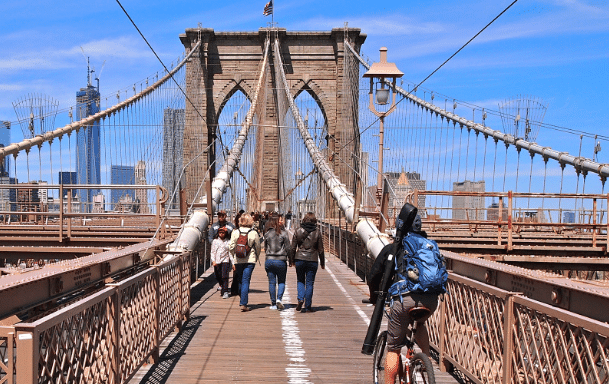 If you reach there during the day, you can sign up to the Brooklyn Bridge Walking Tour. It is also best viewed at night. If you would like to have some proper, fine dining in NYC – the halal way – you can go to Astoria, NYC, and have dinner at Cairo Steakhouse (24-15 Steinway St). Other options for dinner include Mamak House, Taci’s Beyti, and Marrakesh. Mr. & Mrs. Halal Traveling Tip: For prayer, you can stop over at one of the mosques in Manhattan (e.g. Islamic Cultural Center of New York, Mosque of Islamic Brotherhood, and Aun Nur Islamic Center). So, what to on day 2? Check out this New York itinerary 4 days for Muslims and get ready to have another day of adventure in the Big Apple. Today, it is all about the Times Square and the attractions nearby! 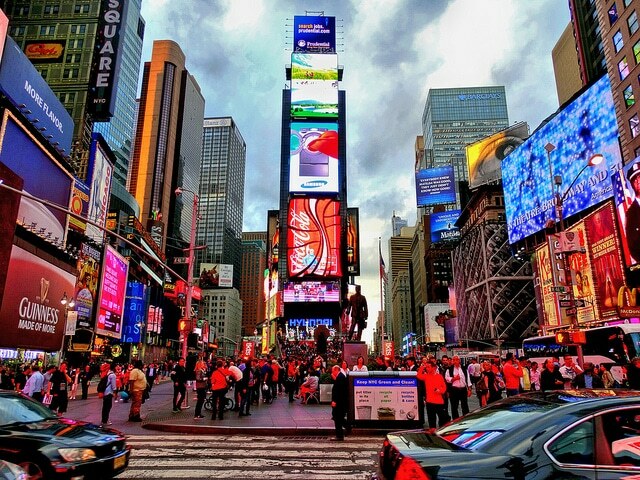 Head over to the junction of 7th Avenue and Broadway St to experience the lively ambiance of Times Square. Don’t forget to take photos and selfies with the backdrop of giant LED-lit advertisement screens and billboards. Mr. and Mrs. Halal Traveling Tip: If you are in NYC in late December, make sure you go to Times Square to join the annual New Year’s Eve Ball Drop Event! There are also many famous museums that you can visit in NYC. 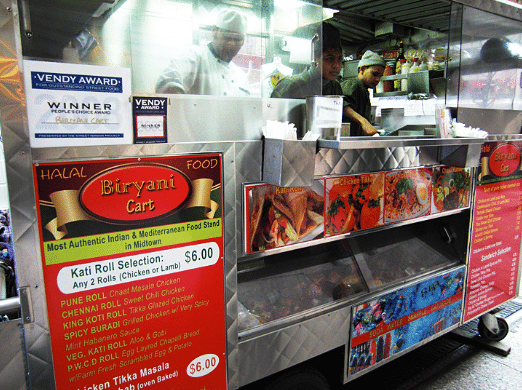 To grab some quick lunch, maybe you want to try some of the halal food carts normally parked near Times Square like Biryani Cart (W 46th St), Kwik Meal Cart (100 W 45th St), and Royal Grill Halal Food (1133 6th Ave). 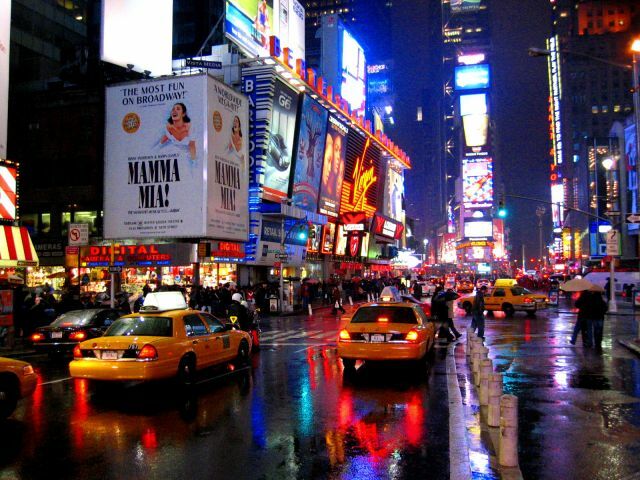 End your exploration of Times Square by walking at Times Square Pedestrian Plaza at night. 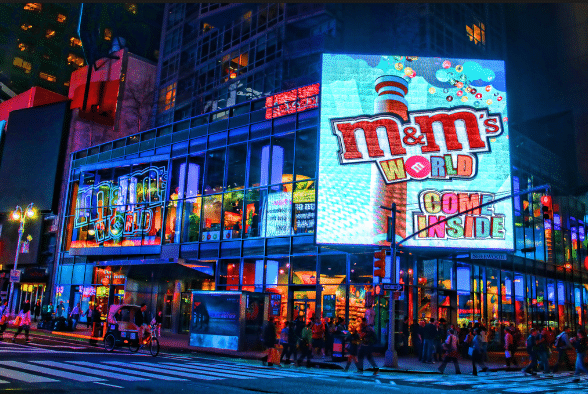 The billboards will get even livelier and brighter at night, thanks to the neon, LED lights. Mr & Mrs. Halal Traveling Tip: Some of the nearby mosques in Times Square are Masjid Usman bin Affan (154 55th St) and Masjid Ar-Rahman (15 W 29th St). Walk a little bit further to 48th Street and visit the famous Rockefeller Center. Again, if you are here during the festive season, you will be able to see the big Christmas tree. There are also ice skating rink and Prometheus statue at the Rockefeller Center. 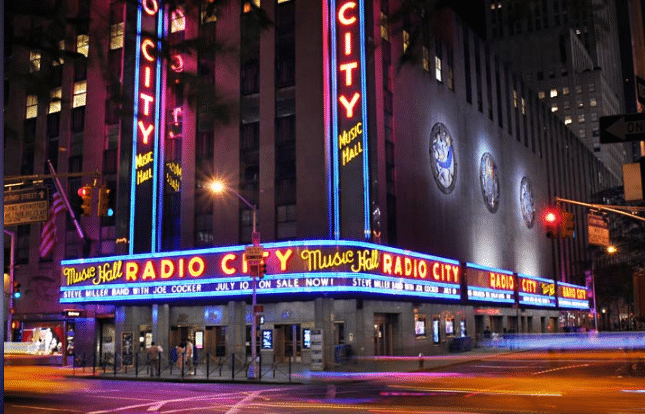 While you are there, take photos at Radio City Music Hall, another famous landmark in NYC. You might already be tired by now, so it is time to head back to your hotel. Tomorrow is another day of adventures. Let’s keep reading this New York itinerary 4 days for Muslims! 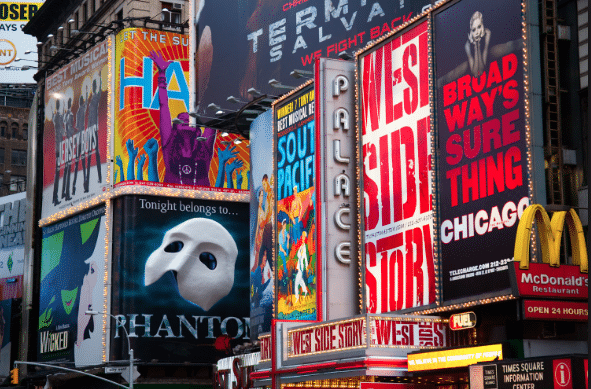 On your third day in New York, let us do something different – you are going for a day trip! You can either rent a car or take a bus to go a little bit out of the city. The duration of each visit may vary, so it is up to you to pick and choose which one to visit first. 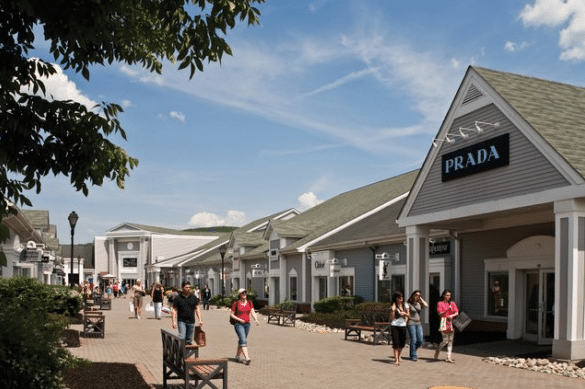 You can shop till you drop and enjoy the view of the freeway/countryside on your way here. You can visit Long Island Aquarium & Exhibition Center, State Historic Park at Planting Fields, and Old Westbury Gardens. You can go to Rocking Horse Ranch to enjoy the indoor water park, horseback riding, archery, and much more. 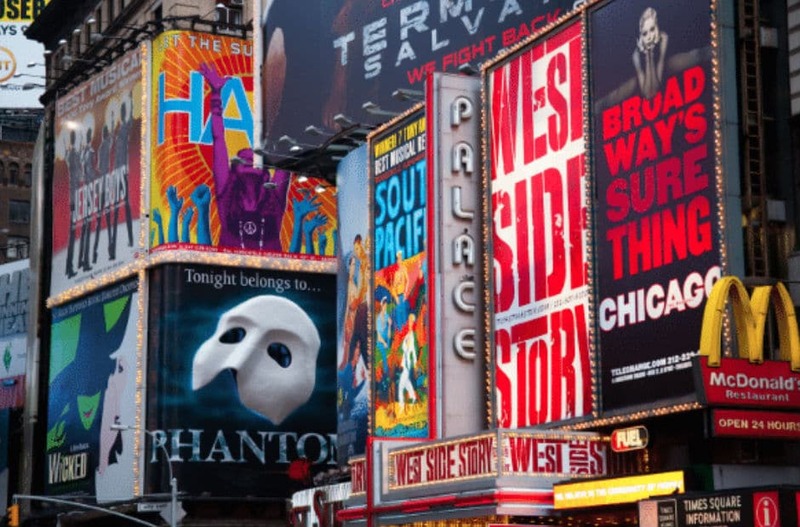 If you are back in NYC early, perhaps it is time to catch a show at the Broadway! Some of the best ones to watch are The School of Rock, The Phantom of Opera, and Hamilton. Today is your last day in New York and we will explore the other parts of NYC that we have yet to visit. In the afternoon after checking out of your hotel, head over to Empire State Building located at 350 5th Avenue. It is NY’s famous skyscraper. You can go to the 86th or 102nd floor to the observation deck to get a glimpse of New York City from above. 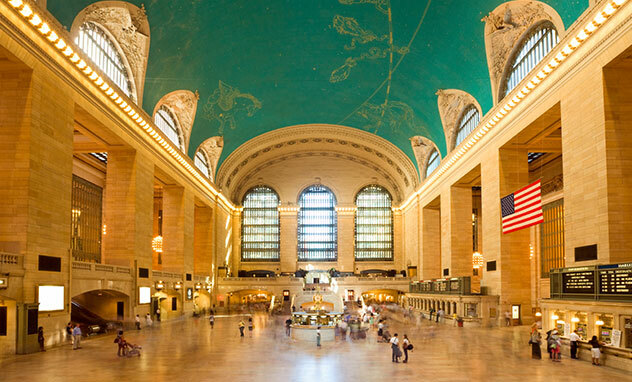 Another famous landmark that you can visit today is Grand Central Terminal Station. It is another classic tourist attraction. Mr. & Mrs. Halal Traveling Tip: For quick snacks, you can try Sammy’s Halal Food (try the lamb gyro! ), Tariq’s #1 Halal Food Cart (famous for its chicken biryani), and Nadal’s Deli (our recommendation: Italian Chicken Wrap). 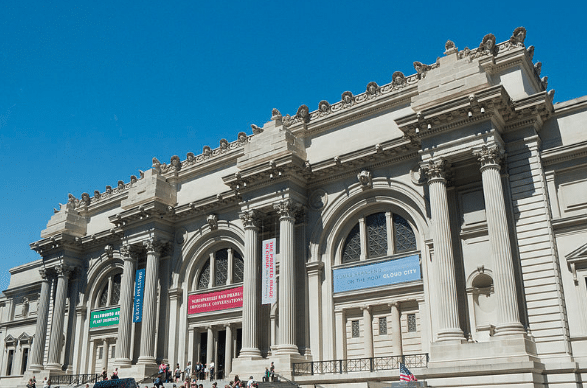 If you have more time to spare, visit one of the most popular museums in the city – The Metropolitan Museum of Art. There are lots to see here – arts, sculptures, artifacts, jewelry, and so much more. 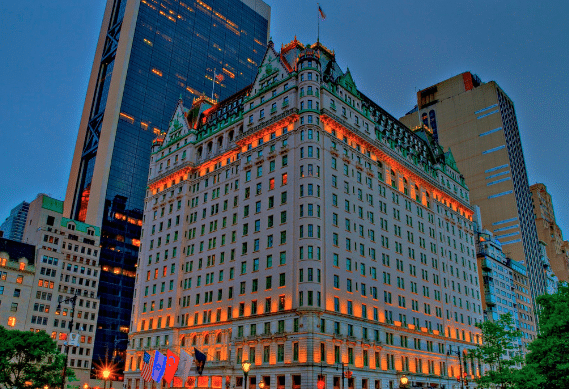 Before heading to JFK or Newark Airport to catch your flight, proceed to The Plaza Hotel for your last photo session. It is the iconic landmark in New York City and has been featured in many Hollywood movies – Home Alone 2 is one of them. So, there you go – New York itinerary 4 days for Muslims! Of course, we have just barely scratched the surface as the Big Apple has so much more to offer. So, make sure you plan another trip to this metropolitan city and get ready for a whole, new adventure! Is there any place in NYC that you’d like to visit but we didn’t include in our New York itinerary 4 days for Muslims? Share with us in the comment box below!